As I mentioned in previous posts, Tim and I worked at Sitka National Historical Park for the last three weeks. Our project was to catalog and rehouse a collection of almost 1,000 glass plate photographic negatives that were recently acquired by the park. We finished the project this afternoon, and we have to admit that we are very proud of what we accomplished. First, let me give you a little background so you will have a better understanding of the collection itself. Between 1897 and 1929 E. W. Merrill, who was known in Sitka as the “Father of Pictures,” produced thousands of photographs. Merrill used large format cameras to create each negative, most of which were eight-by-ten inch glass plates, and he sold prints of his work in his shop in Sitka. Appreciation of Merrill’s work has grown in recent years, not only for the history that he documented, but also for artistic value of the photographs themselves. Merrill is also closely associated with Sitka National Historical Park. He served as the first caretaker of the park from 1919 to 1922 and was instrumental in selecting appropriate locations for the totem poles for which the park is famous. The park was also a favorite subject of Merrill’s, as well as a background for many of his photographs. Our job was to catalog all negatives in the collection and store them in a more appropriate and archival manner. This involved removing each negative from its existing sleeve, examining it on a light table, writing a detailed description of the image itself, assessing the condition of the plate and placing the negative in a new four-flap envelope that had been pre-folded and labeled with the catalog number. All information about the negative was then entered into an extensive computer database. Tim was in charge of cataloging the information in the computer, and I was responsible for handling and rehousing the negatives and formulating an initial description. Did you know that you have to wear latex or disposable gloves when working with glass plates? I was a little intimidated to be dealing with such large and fragile pieces of glass, but I managed to get through without breaking or even chipping a single plate. The already-broken plates were especially challenging to deal with. Thank goodness there weren’t too many of those. I Usually Use Disposable Gloves to Dump the Tanks, Not Handle Glass Negatives! As a former museum curator for Rocky Mountain National Park, Tim is an expert at cataloging. It doesn’t really matter whether the item is a glass negative, a piece of pottery or a legal document, the procedure is the same, as is the type of information that must be recorded. This project, however, was a massive one, and I’m not sure we were quite prepared initially for the amount of work involved. Soon after we started, we realized that we would have less than five minutes to spend on each negative if we were to finish the project in the original two weeks. When the park’s museum curator indicated that her priority was quality (a more detailed description) as opposed to quantity (the number of plates cataloged), we determined that we could finish about two-thirds of the collection. However, it bothered us to leave a job unfinished – we’ve always finished every project we’ve undertaken. Luckily, the staff liked our work and asked us if we would be willing to stay an additional week. Although that would cut into our time exploring Alaska, we readily agreed and signed up for a third week. For us, one of the challenges was our lack of familiarity with Sitka history and the subject matter captured in each image. Merrill’s interests were quite diverse, and he photographed not only people, town scenes and landscapes, but also dead birds, flowers and museum objects. Merrill was particularly interested in the local Tlingit people, and there are many photographs of Native individuals, places and decorative objects. 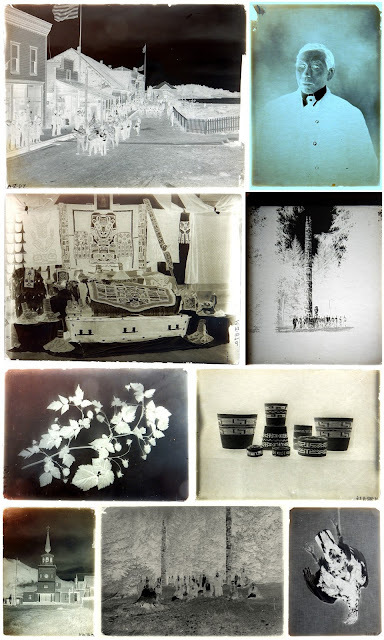 Examining this amazing collection of photographs gave us an incredible insight into the history and culture of Sitka during the late nineteenth and early twentieth century. Although we are still far from experts on the subject, we learned so much in such a short time and came a long way in being able to identify what was pictured in each image. One of our favorite parts of the project was working closely with the amazing staff at Sitka National Historical Park. Mary, the park superintendent, was a major supporter of the project. Kelsey, the museum curator; Brinnen, the chief of resources; and Lizzie and Amanda, the museum interns, could not have been more accommodating or helpful. Everyone went out of their way to answer our numerous questions and facilitate our work. The park even included a mention of us in a Facebook post. That was a first for us! You might be wondering how we came up with a gig like this. When Tim retired from the National Park Service, he decided to seek out short-term consulting projects at different national parks. Not every park has a curator, but every park must perform the same type of work and submit the same yearly reports. Tim typically contacts parks in areas we might be interested in and submits a proposal. He doesn’t want to work too much – he is retired after all – but a two-week project every few months is ideal. Since he retired in March 2014, Tim has had projects at Big Thicket National Preserve in Texas, Chickasaw National Recreation Area in Oklahoma, Fort Union Trading Post National Historic Site in North Dakota, Fort Davis National Historic Site in Texas and now Sitka National Historical Park. It’s been an interesting way of determining our general travel route. Although Tim is paid for his work, I have been volunteering my time. I have worked with Tim on his last three projects, each of which required two people to complete the job in the allotted timeframe. For the most part, we have worked extremely well together, and we have enjoyed ourselves. Most national parks welcome volunteers. Although the most common volunteer position seems to be campground host or visitor center assistant, other opportunities are sometimes available. Volunteer.gov is a great resource for finding openings. Sitka National Historical Park, for example, often advertises for museum management volunteers who have the necessary qualifications. Even if you do not see a listing for something you may be interested in, you may want to contact the park directly if you have a particular ability that might benefit the park. Each park has a volunteer coordinator who can provide information. Volunteering can be a very rewarding experience. I'm glad that I was able to answer your questions. We were so fortunate to have this opportunity, and we learned so much. It was also good to give our brain cells a nice workout. Appreciate the post, Sarah ... fascinating work. As Pam commented above, I would have become too engrossed in the images, and the research that I would probably not have been able to complete the project in the allotted time. Of course, practice with cataloguing I imagine comes in handy with moving things along. I often did spend too much time on a single image! With my background in historic preservation, it was the town scenes that I especially enjoyed. There were quite a few images taken from the same spot, but over a period of many years. It was so interesting to see the evolution of the town. Tim often had to tell me to hurry up and not take so much time describing a single negative! He was the one who moved things along!